Rewarding Times has teamed up with Farm Restaurant, on Dawson St, Dublin 2 to offer you a chance to enjoy a delicious 3 course meal for two people for only €55. At Farm Restaurant, they love Irish food and ingredients. Their menus take inspirations from some far-flung destinations, but they source locally as many of the ingredients as possible, and a large proportion the meat, vegetables, and other ingredients are organic – free from GM, artificial additives, fertilisers, growth promoters and herbicides - and/or free range. They believe that this is better for your health, better for the environment, better for farmers, and more delicious! 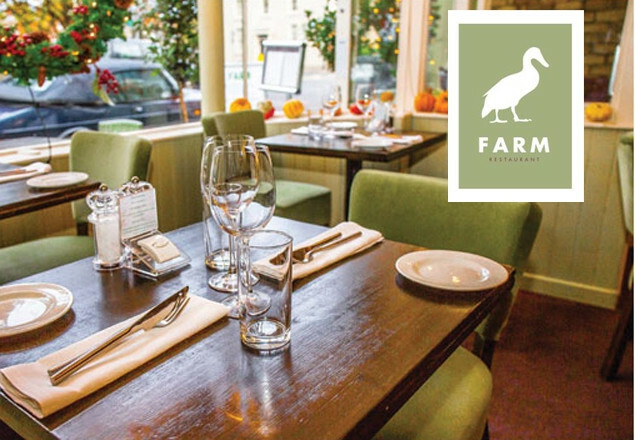 Farm Restaurant take particular pride in approaching vegetarian, vegan, and gluten-free dishes with the same passion, and insistence on quality that we bring to all of the meat, poultry and fish dishes. ​Many customers are regulars – from business-people who want more than a mass-produced salad and sandwich for lunch, to couples lingering over a romantic meal; from families with high-chairs and high-spirits to old-friends re-uniting in Dublin after years apart. All are welcome at Farm restaurants.